Q: What exactly is glaucoma? A: Glaucoma is a condition in which the eye's intraocular pressure (IOP) is too high. This means that your eye has too much aqueous humor in it, either because it produced too much, or because it's not draining properly. Other symptoms are optic nerve damage and vision loss. Glaucoma is a silent disease that robs the patient of their peripheral vision. Early detection is very important. A: Myopia is caused by a combination of environmental factors and heredity. Studies show that if we can move the focal point in front of the mid peripheral retina we can slow the progression of myopia. The increased use of cell phones and computers, as well as less time outdoors is probably a contributing factor. Why do my eyes water all the time? What can I do to make it stop? Although it seems counter intuitive, watering is a sign of dry eye disease. When the eyes are dry a signal is sent to the brain to trigger tearing. In order to stop the eyes from tearing we need to treat the dryness. There are many lifestyle factors that contribute to dry eye disease. For example, while watching television, using a computer or reading we are so fixated on the task at hand that we do not blink as often as we should and the tear film evaporates and leaves our cornea exposed to the air. Another example is spending time near a fan or in front of an air vent; this too can cause our tear film to dry up quickly. While there are several more reasons for dry eye disease to occur, the good news is that it can be treated. There are several drops, medications, and home remedies that can be used and your optometrist can help to determine the treatment plan that is right for your type of dry eye disease. We recommend that everyone get a complete eye exam every year. This insures good ocular health and insures we catch a problem while it's still a small one. This is especially important if you are a contact lens wearer. You have an increased risk of serious complications that may not be evident until examined. Don't be fooled into thinking your eyes are healthy just because you think you're seeing clearly. Your eyes are also a good source of information regarding your overall systemic health. Diseases like high blood pressure, diabetes, M.S., high cholesterol, and many others frequently show up in the eyes, and regular eye exams can help to monitor or detect these conditions. Ask yourself this . . . would you rather lose your teeth or your vision. Don't take your vision for granted! Don't let your insurance company dictate how often you should be seen either. Do you think they care about the health of your eyes like we do, or do you think maybe they just want to cut costs? Get your eyes examined every year. Floaters are usually a normal thing that most people experience under the right conditions, but there are a few situations that might indicate a serious condition. If a sudden increase in the number of floaters is seen, or if associated with flashes of light, you should seek care immediately. In most cases, these are normal things floating around in our eyes. These may be blood cells, or strands of collagen which have clumped together that make up part of the gel in the eye, or remnants of tissue when our eyes first developed. These structures in the eyes are not entirely transparent, and will block some light. So when light comes in the eye, what is seen is actually a shadow of these things floating in the gel. They are most noticeable when in a brightly lit room while looking at a uniform white wall, but they are always there, we just don't notice them. Although floaters can be very annoying, they should present no threat to the health of your eyes. Cataracts occur when the lens inside the eye becomes cloudy and less transparent. You may experience light sensitivity, blurry vision, and distorted colors. Studies suggest that antioxidants in the diet may lower the risk for developing cataracts. Smoking also contributes to the development of cataracts. The most common reason for the development of cataracts is the natural aging process. Other causes are trauma to the eye, excessive ultraviolet exposure, and certain systemic diseases, such as diabetes. The only way to get a good view of all the structures in the eye is to dilate them, or open the pupil up very big. If the eyes weren't dilated with eye drops, if we tried to look in them with a light, the pupils would just get very small and it would be very hard to see inside. It would be like trying to look through a keyhole, we would only see a small area, but when dilated, it sort of opens up the door to the eye so we can view everything. Everyone should have their eyes dilated on a regular basis. If your doctor is not doing this, he or she could be missing a possible sight-threatening condition like a retinal detachment or retinal hole to name just a few. Also, anyone who has diabetes should be having a dilated eye examination at least annually, as the leading cause of blindness in the working population is from diabetic retinopathy. The dilation typically lasts about 4 to 6 hours and will cause it to seem very bright outside, so remember to bring your sunglasses. It may also make things blurry up close, especially for reading or work, so keep this in mind when scheduling your appointment. First of all it is nothing to be ashamed of! It is not a disease, and is nothing that cannot be easily corrected with glasses or contact lenses. Astigmatism is simply a refractive condition that has to do with the way light focuses into one's eyes. The cornea is the clear front part of the eye that focuses most of the light into the eye. If the cornea is spherical, like a baseball or basketball, when light comes into the eye in different directions, all the light is focused into one point. If the cornea is shaped like a football, where one meridian or direction is steeper than the other, light will be focused differently as it enters the eye in different directions 90 degrees apart. This will cause blurred vision at distance and near if it is not corrected. What's the difference between farsighted and nearsightedness? Both are refractive conditions, meaning that they are problems related to how the light is focused as it enters the eye. Ideally, as light enters the eye, without any additional effort, the light would be perfectly focused onto the inside lining of the eye which detects the light, called the retina. The brain would than see a clear view of the world. This person would not need glasses for the distance. If a person is farsighted (hyperopic), the optics of the eye are too weak (or the eye is too short), and the rays of light would focus behind the retina, causing a blurred image to be on the retina. This person in general would see better at distance than near, or be "farsighted." If a person is nearsighted (myopic), the light rays focus in front of the retina because the optics are too strong (or the eye is too long). This also causes a blurred image to fall on the retina. This person would see better at near, or be "nearsighted. What's the difference between an optometrist and an ophthalmologist? The main difference between the two, is that ophthalmologists perform surgery, where an optometristwould not. For instance: cataract, refractive, or glaucoma surgery. Optometrists would be involved in all of the pre- and postoperative care of these patients; collecting accurate data, educating the patient, and insuring proper healing after the procedure. An ophthalmologist is more of a specialist, who would need only to be involved if some kind of surgery were being considered. An optometrist can treat most any eye condition, including the use of topical or oral medications if needed. This might include the treatment of glaucoma, eye infections, allergic eye conditions and others, to name just a few. A third "O" that often comes up and confuses people is an optician. An optician is not a doctor, and they do not do eye examinations. They do play an important role though in most eye doctors' offices. An optician most often handles the optical and glasses side of things. They help patients pick out the correct eyewear, including the frame and lenses. Many also are trained in the making of glasses in the lab. 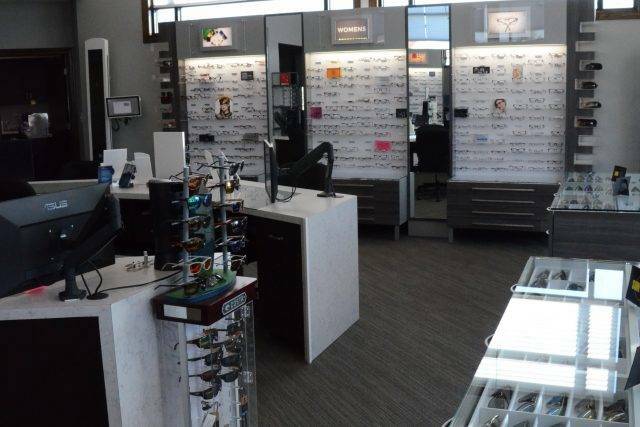 In some states, opticians must be licensed to do their job, though Colorado is not one of them. I'm over 40 and I can't read well up close. Why? The closer we hold something, the more focusing our eyes have to do to keep things clear. As we get older and reach the age of about 40 to 45, the lens inside our eyes becomes less able to change shape and focus for up close, and we have to hold things further away to keep them clear. This is called presbyopia. Some people begin to think their arms simply aren't long enough! Reading glasses or some type of bifocal will take care of this problem easily enough. It is a hereditary disease in which increased fluid pressure in the eyeball causes damage to the optic nerve, which causes a loss of peripheral or side vision. The worst thing about glaucoma, is that it is almost always a "silent" disease, meaning we don't have any idea we have it, and don't realize we are losing vision until the vision is lost forever. The most effective way to treat glaucoma is to catch it early and lower the pressure in the eye before the damage is done. The best and only way to insure this is to have annual eye exams including an evaluation for glaucoma. The most common way to treat glaucoma is the use of eye drops on a daily basis to help lower the pressure of the fluid in the eye. There are also a number of laser and conventional surgeries which can be performed, but typically are done in conjunction with eye drops, or if poor control is obtained with eye drops alone. There are a number of factors that also put certain people at risk for the disease. These include being over the age of 60, a family history of the disease, diabetes, high blood pressure, smoking, and being of colored decent. It is a common complication of diabetes that occurs when tiny blood vessels in the retina are damaged by the load of sugar they are carrying. Your vision may become blurred and night vision impaired. All people with diabetes should have an exam with dilated pupils at least once a year. Laser surgery can help shrink abnormal vessels in the early stages of the disease. Diabetic Retinopathy is the leading cause of blindness in American adults, and the saddest part of that statistic is that most of these cases could have been prevented with regular eye exams. People with diabetes are also at a greater risk of developing cataracts and glaucoma. Age-related macular degeneration (AMD) is the leading cause of irreversible vision loss in people over 65 in the United States. It is a slow, progressive, and painless condition that affects the macula, the small central part of the retina that allows you to see fine detail clearly. The exact cause is not yet known, and currently, there is no permanent effective treatment or cure for the condition. A growing body of research seems to suggest that nutrition plays an important role in AMD. Many of the studies are focusing on the role of a group of antioxidants called carotenoid (the pigments that give fruits and vegetables their color). Two of these carotenoids, lutein, and zeaxanthin, are the only pigments found in the macula. A diet including at least two to four serving a week of vegetables high in lutein and zeaxanthin may help lower your risk of developing AMD. Leafy, green vegetables highest in these carotenoids include kale, raw spinach, and collard greens. Nutritional supplements may be a beneficial alternative to this type of diet. Should I buy my contact lenses over the phone or Internet? The first thing you need to remember is that price is not the only thing that determines value. Other factors need to be considered. How long will it take to get the lenses? Are they in stock, or will it take even longer than they advertise it will? Can they even get the lenses my doctor thinks are the best lenses for me? Will they give me free replacement lenses if I tear or break a lens? Where is this company located? Are they helping my community? Will you get any rebates that the manufacturer is offering? Of course, we prefer you let us handle taking care of your lenses, and that you purchase them from us. Sometimes we're a bit more expensive, but often not . . . especially if you are being charged for shipping. We can almost always get your lenses within 2 days, with no extra charges for shipping or handling. If you purchase a minimum number of boxes, we can even ship them directly to you at no extra charge . . . that's as convenient as it gets! That means while you're in the office for your appointment, we take care of it all right then, no time wasted on the phone or on the Internet searching to try to save a few bucks or to find out we're actually less. Everything's all done at your one visit. We even give you free replacement contacts should you rip or break a lens. That's big. The few bucks you save can easily be made up in no time if for example, your 12 months supply of lenses only lasts 9 months. You will not get lenses free over the Internet should this happen, that's one thing I'm sure of! Often, we have manufacturers rebates that are not available from any of these places. These can more than make up for any price difference in itself. The most important thing to keep in mind is that we care about your eyes! We are your local office who is here for you should you have a problem. We contribute to the local economy and help out the community in a number of ways. Unfortunately, these mail order places really don't care about you or the health of your eyes, just the money that you spend buying their product. These companies are not looking out for the well-being of your eyes, as much as they might say they are. Standards are clear for contact lens prescriptions . . . they expire after 1 year. And for good reason. To make sure your eyes are healthy. Contact lenses are medical devices that can cause problems that can lead to blindness! These companies do not live by these standards and replace lenses illegally with expired prescriptions. I can't support a practice that does not look out for the well-being of my patients. Ignoring all the other good reasons I've listed here, this one to me is by far enough! Besides, where would you rather spend your money, here locally in Larimer County, where you'll see the person you bought your lenses from at your local store, or would you rather put it into some other stranger's pocket in some other state whom you'll never even meet. Is it really worth it buying from a mail order place? You'll be the judge. Tears function to keep the eyes lubricated and comfortable. Dry eyes are caused when the tear glands do not produce enough tears and/or the tear ducts drain too many tears off the eye surface. Dry eyes can also be produced by a poor tear quality, and not necessarily a volume problem. Either situation causes the eyes to feel irritated, scratchy, burning, red and uncomfortable. DES is the most common of all eye disorders, affecting about 20% of our population in the U.S. Due to the altitude and dry climate here in Colorado, this is even more of a problem. Your eyes are lubricated by two different types of tears, lubricating and reflex tears. Lubricating tears are produced continuously to moisturize the eye and contain natural infection-fighting antibiotics. Reflex tears are produced in response to sudden irritation, injury or emotion. Ironically, the irritation from dry eyes can trigger reflex tears, which flood the eye. But because reflex tears do not have the proper lubricating composition, the discomfort persists. Thus, "watery eyes" can actually be a symptom of DES. Aging process. Tear flow normally decreases with age. About 75% of individuals over age 65 suffer from DES symptoms. Contact Lens Wear. This dramatically increases tear evaporation, causing discomfort, infection, and/or increases protein deposits. DES is the leading cause of CL intolerance. Hormonal Changes in Women. Pregnancy, oral contraceptives, and menopause contribute. Environmental Factors. People who are exposed to smoke, air pollution, high altitude, sunny, windy, cold, dry air conditions are at risk for DES. Side Effects of Disease/ Medications. Several diseases and medications decrease your ability to produce tears. Treatment of DES: Depending on the severity of the condition, numerous things can be done to help the situation, but DES is a chronic condition, and will likely always be present. Treatment may be as simple as using artificial tears a few times a day. Other things that help are using a humidifier, drinking lots of water, and keeping your lid margins extra clean. In more persistent cases, a simple non-surgical procedure is available in our office that provides long-term relief through the use of tiny plugs called "punctal occluders or punctal plugs". As the name suggests, the device occludes the punctum, or tear duct, which is the drainage duct that carries tears away from the eye. Blocking these drainage ducts prevents tears from draining away too quickly. Punctal occlusion can be compared to putting a stopper in a sink drain. This widely performed procedure is safe, quick, painless, and totally reversible. Punctal occluders are made of a very soft flexible silicone, similar to that used in soft contact lenses. Though they are barely visible to the naked eye, they are carefully manufactured into an extremely smooth and precise design. Untreated, symptoms will most likely intensify, making daily life unpleasant, or worse, deteriorate your visual acuity. If you suffer from any of the symptoms discussed here, schedule an appointment today to discuss these options with either Dr. Dunlap or Dr. Jeziorny.